It would have been about 25 years ago that I extended a business trip so that I could drive up to Duluth from Minneapolis to get measured up for my Aerostich Roadcrafter suit. It has, I have to admit, seen better days, but the original Aerostich concept was brilliant and, for some riders, it still is. In essence, the Aerostich is an over-suit. With a clever zip that runs from the neck to the left foot, you can get into the suit in 10 seconds, and out of it just as quickly. In the States, a lot of riders tour in the suit. The beauty is that when you stop for coffee or for lunch, you unzip it and go about your business in your normal jeans and plaid shirt! 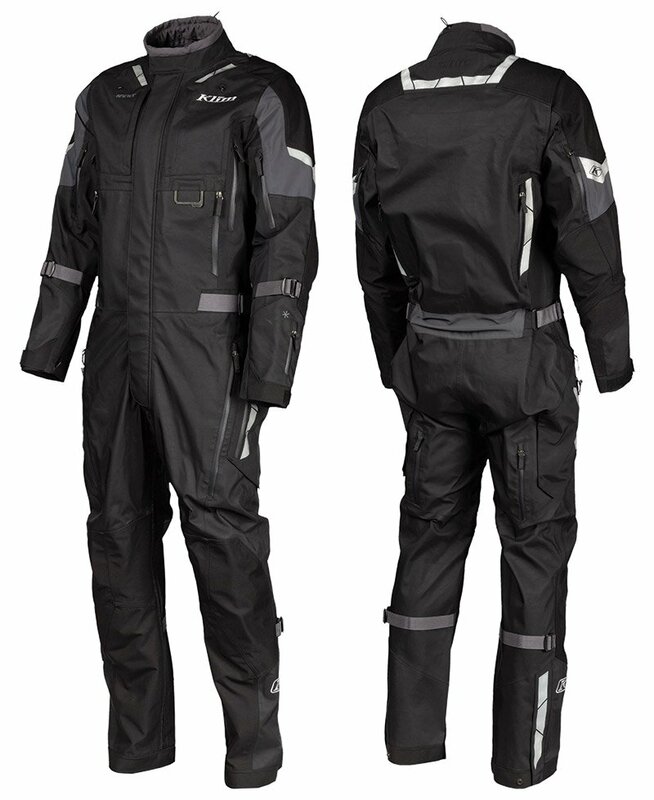 I have used my Roadcrafter suit on trips all over Europe. It is nice to get off the bike, lock the suit to the grab rail, and walk around town to look for a restaurant or a café in your normal mufti; especially when it’s baking hot. 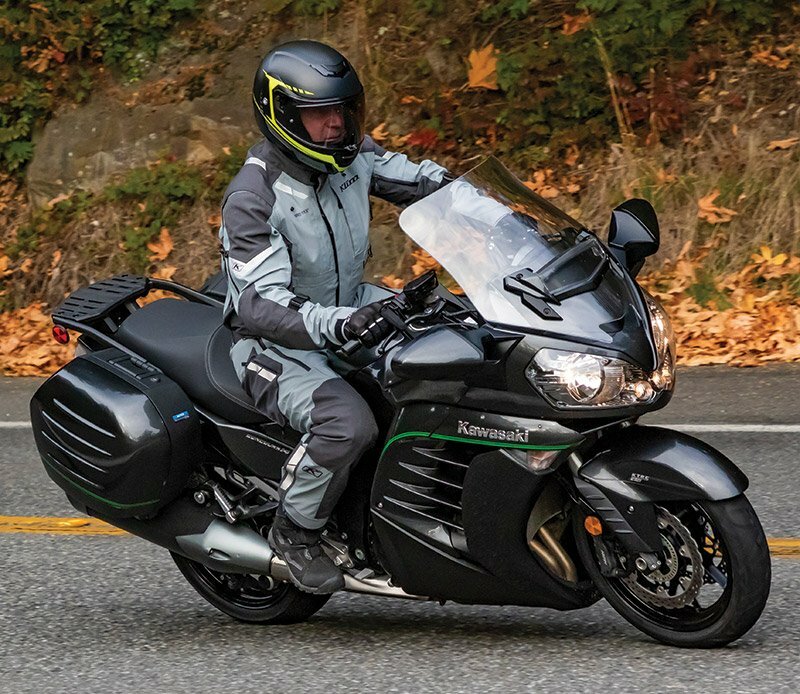 But, over here, the Roadcrafter has proven even more popular as a commuter suit for those who want to ride into work wearing their office wear underneath their suit. And, for many years, this is what I did. I’d travel all around the country to meetings wearing my work trousers and a shirt and tie beneath my Aerostich. The Roadcrafter was also, for me, a godsend when I used to fly for business a lot. Bikes park for free at most airports. I’d take the Aerostich off in the multi-storey car park, and walk into departures. When I arrived back, I’d simply and swiftly zip on the suit, and head home. But the technology employed by Aerostich is no longer state-of-the-art. It was always a laminated suit, but neither the main zip nor the under-arm vent zips were particularly waterproof, so some water ingress went with the territory. The suit was well constructed, and highly abrasion resistant, but the armour was never great, and mine couldn’t even take a back protector. We always felt there was room for an Aerostich suit made to modern European standards. Spidi did one a while back, but it was let down by its unusable Aquaseal zip. American maker, Olympia, produced one, but the quality wasn’t there. Even Rukka gave it a go, but their version wasn’t laminated, and was let down by its poor ergonomics. But now Klim has thrown its hat into the ring with a suit called the Hardanger. 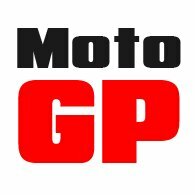 We were hugely excited when we saw it at the Intermot show last November, because it looked to be exactly the suit we had been hoping someone would make. Let’s talk through the spec.. 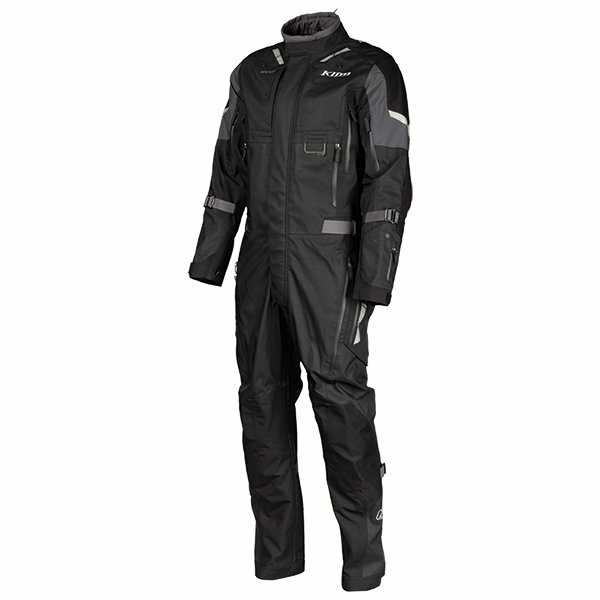 The outer chassis is a laminated Gore-Tex Pro Shell. This means that the suit will never wet out. 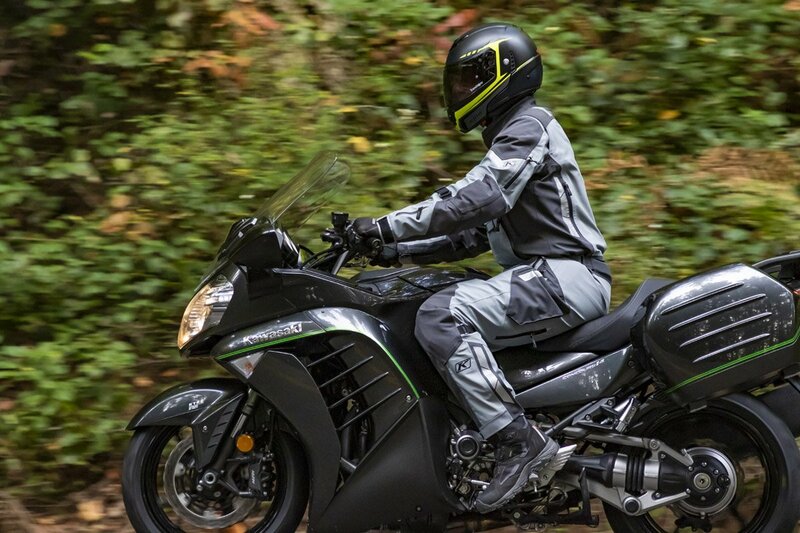 You’ll stay dry however long you ride in the rain; and when you stop, the suit will dry out quickly. It simply doesn’t get more waterproof than Gore’s three-layer laminate construction. What we cannot be totally confident of is whether you will occasionally get a touch of water ingress through one of the Hardanger’s 14 vents. These vents are protected with waterproof zips but, in extremis, we wouldn’t want to guarantee that there couldn’t occasionally be a tiny bit of seepage. But, on a suit like this, venting is important. If you’re touring on the continent, or commuting through the summer, and you’re wearing your daily clothes underneath, you’re going to need vents to help you stay cool. We might suggest that 14 vents is OTT, but venting is Klim’s thing, so 14 vents it is: two on the chest, two on the forearms, two on the triceps, two on the biceps, two on the back, two on the thighs, and two exhaust vents on the rear of the thighs. From a pure protection standpoint, the Hardanger is more than up to the job. It meets the new CE standard at the AA level, which is about as good as it gets right now for a textile garment. The elbows, shoulders, knees, and lower legs are overlaid with 750 Dernier Cordura. All the armour is D3O: shoulders, elbows, hips, knees and back. And it’s all adjustable. One of the beauties of the Aerostich was the ease and speed with which one can get in and out of the suit. 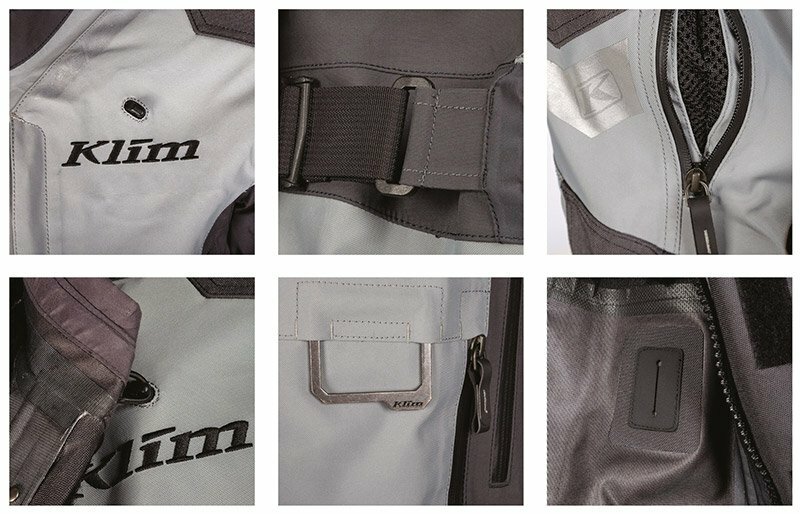 The good news is that the design of the Klim is virtually identical. You connect the main front zip at the neck, and then in one movement you run the zip down to the left foot. Before this you’ll have to put your right foot in the right leg of the suit. You then just run the zip down the right leg, from the crotch to the foot. Once you’re in the suit, you’ll start to appreciate the detail. And there’s a lot of detail on the Hardanger to appreciate. It really does have a pretty impressive spec..
Like volume adjusters on the arms, at the waist, and around the calves. And around the bottom of the leg. Pockets on the Hardanger are almost as prolific as the vents. There are two on the chest, two on the front of the thigh; there’s a pocket on the left forearm for a credit card or pass, and an internal chest pocket. You also get two hand-warmer pockets. The sleeve ends fasten by zip and Velcro to allow plenty of room for the glove cuff to be worn inside the sleeve. One little touch that we really like, but which we’ve never seen before, is a neck collar that adjusts with an elastic cord. It’s fabulous. A tiny detail perhaps, but really clever. Behind the shoulders there’s a gusset to make it easier for the rider to move around the bike. There are also lots of high-vis panels all over the suit. So, by now you might be getting the impression that we quite like the Hardanger. Well, you wouldn’t be wrong. 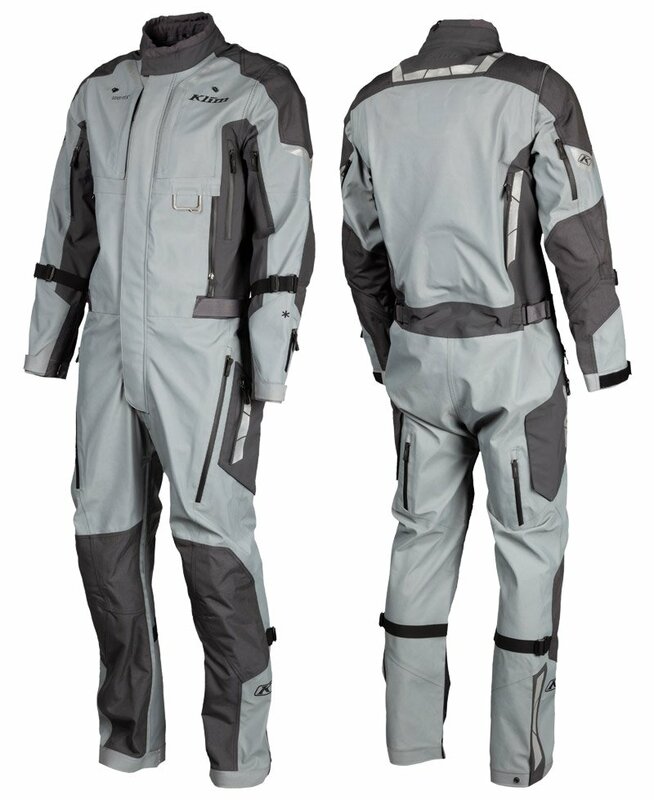 We’ve been trying to get somebody to make an up-to-date Aerostich suit for years. And we reckon Klim has done an amazing job. The suit’s got everything we could or would have wanted. And more. There’s only one area in which the Hardanger gives ground to the Aerostich, though. And that’s in the thermal department. Frankly, the Klim doesn’t do much to help you stay warm. And we understand why. You couldn’t have a suit this well vented if it had a thermal liner. It wouldn’t work. You can make a really well vented suit, or you can make a really warm suit. But it’s simply impossible to have one garment that does both. Klim has, as you might expect, chosen venting. For us, this makes total sense. If the Hardanger was endowed with a built-in thermal lining, it wouldn’t never work in hot weather. But you can always make a well-vented suit work when it’s cold. It’s simply a matter of layering up. Of course, you’ll often be wearing your day clothes beneath the suit, so most of the time you probably wouldn’t want the Hardanger to be overly warm. For us, something like Rukka’s Down-X padded jacket worn beneath the suit would be ideal, but any duck-down style jacket would work. As would a good fleece or soft-shell. The only other observation we would make is that, by European standards, the Hardanger has very long legs. Perhaps Klim expects everybody to be riding a tall KTM of some description. The regular leg is long. The long leg version is absurdly long. Their short leg is going to be, in our world, a regular leg. The bad news, I’m afraid, is that if you’re challenged in the leg department, from a horizontal perspective, the Hardanger might not work for you. Hopefully, Klim will address this issue in the future because, here in the UK, 30” is one of the most popular leg lengths. Where we get to is this. We love the Aerostich concept, but the technology employed by Aerostich is now distinctly old school. The Klim is a totally up-to-date, 21st century interpretation of the original. 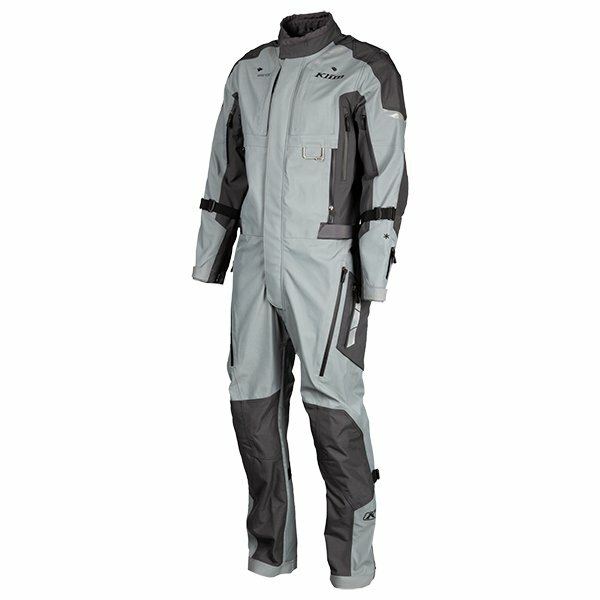 It’s brilliant suit that, for many people, will become the perfect riding outfit. Klim has created a suit that will, we predict, become a staple and a classic. 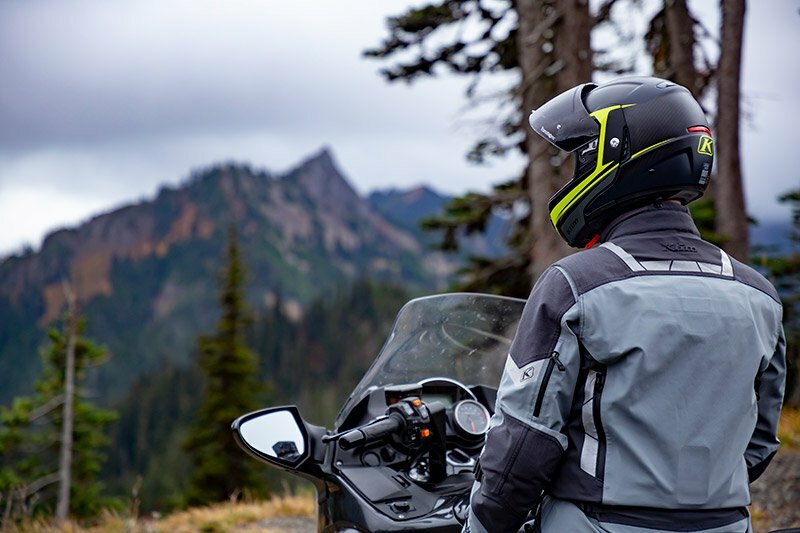 Click Klim Hardanger to shop the Klim Hardanger.